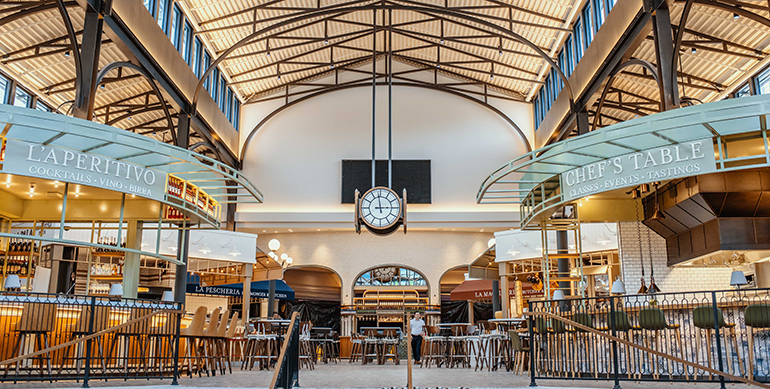 Perhaps no operator has more extensive synergies between its foodservice and retail offerings than Eataly, the Italian food hall/market concept. At its recently opened location in Las Vegas, the retail-restaurant hybrid has fused the two segments of its business more thoroughly than ever. “Eataly Las Vegas is truly a milestone for our retail/restaurant synergy evolution,” said Raffaele Piarulli, VP of operations at Eataly USA. The company calls the format “La Cucina del Mercato” — “Kitchen of the Market” — where customers can order their food at small standalone foodservice venues and can also select from products to take home and cook. In addition to the meat counter, similar experiences are also available with seafood, pasta, salumi and cheese, pizza and wine. He said the popularity of Eataly’s foodservice offerings allows the company to educate customers about the products available for retail sale through menu design and through the education of its workers. Staff are trained to show customers where specific items are merchandised, and recipes and cooking suggestions are also readily available, he said. Piarulli said Eataly’s retail purchasing team and its culinary team work together continuously. For example, Eataly has began carrying Culatello di Zibello DOP, which he described as a “high end cousin of prosciutto crudo” that just recently became available for import. Eataly merchandised it for retail sale, and also incorporated it into several salumi and cheese boards on the foodservice menus. Italian white truffles are another example, he said. The most recent “Truffle Day” — Dec. 23 — featured white truffles in every restaurant at Eataly USA, while the same truffles were on sale at 50% off in the case. “Special occasions aside, cross-promoting our retail products in our restaurant is just what we do as default,” said Piarulli.